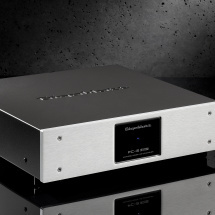 GIGAWATT PC-2 EVO+ is a technologically advanced, new generation power conditioner, designed to power and protect audio-video systems of Hi-Fi and Hi-End class. This conditioner not only effectively protects against interference and overvoltage existing in the home power grid, but also guarantees a significant improvement of the quality of sound and displayed picture of the devices connected to it. 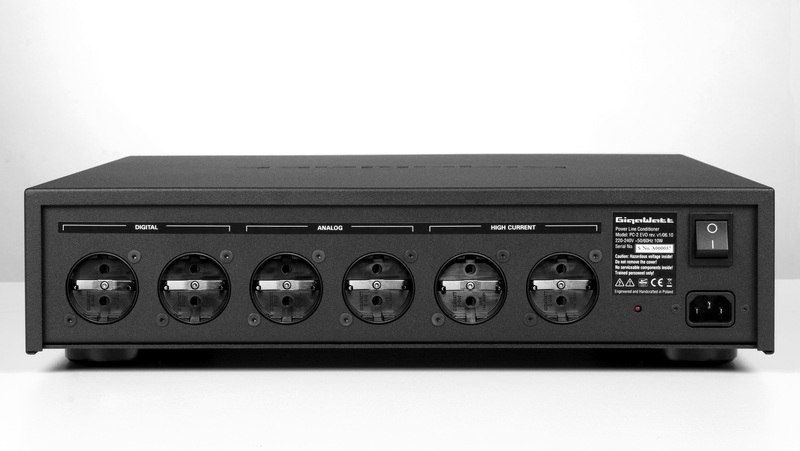 The PC-2 EVO+ has six, high quality proprietary GigaWatt power sockets, with large surface contacts. The brass contacts of the sockets were subdued to the process of technical silver plating without usage of intermediate metals, like copper or nickel, which could introduce an unfavorable serial resistance and a voltage loss. The increased surface of the contacts and the thick layer of silver guarantee good contact with the plug pins. The sockets were additionally cryogenically modified and de-magnetized. Proper operation of the unit is indicated with a blue LED mounted in a display in the middle of the fascia. The conditioner is also equipped with an additional circuit signaling wrong connection to the power grid. Its action is indicated by a red LED on the back of the unit, which signals wrong polarity of the device or faulty grounding. The conditioner PC-2 EVO+ is equipped with multistage parallel filters. Three, independent filtering branches, which supply three sections, composed of two output sockets each. Due to this solution the kind of filtering was adjusted for the load it has, different for each type of devices – digital, analog or high current devices. Autonomous passive filters allow for isolation from interference produced by the devices connected together via a shared power line. The PC-2 EVO+ is based on a novel filtering architecture and uses new components. The main novelty are the anti-interference capacitors and the compensation batteries for the buffering circuits, which are manufactured by the company Miflex, according to GigaWatt specification. 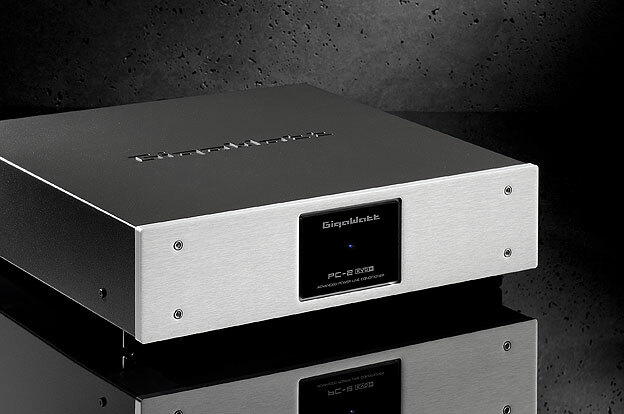 In the PC-2 EVO+ an innovative, two-stage current distribution system is used, a proprietary design of our company. It is based on massive third generation distribution rails, made from polished slabs of oxygen-free copper OFHCC 10100 with 99.995% purity. The first stage allows for lossless and even distribution of voltage to each of the filtering branches. The second stage provides current directly to each pair of output sockets via bolted and clamped connections as well as cabling with conductors with 2.5QMM cross-section made from oxygen-free copper. The star connection topology and high conductance combined with the 30 QMM cross-section of each of the rails allow for an uniform and stable power distribution regardless of the load on the individual outputs of the conditioner. Due to the improved efficiency of the filtering circuits, they were mounted using silver solder on massive PCBs having twice the amount of copper compared to standard PCBs. The single layer PCBs have very wide traces made from silver plated copper, with a thickness of 70 micrometers. The interference is damped by filtering blocs of RLC type, built around proprietary Audio Grade capacitors and IP (Iron Powder) core filters. To allow for the maximum impulse response, the PC-2 EVO+ is equipped with a double buffer circuit with Audio Grade compensation batteries, a proprietary design. The circuit increases the current output with non-linear loads, like power amplifiers, as well as eliminates the difference of power between the input and output of the conditioner. This allows for almost unlimited impulse capabilities, unheard of in other passive conditioners and not reachable for active conditioners. The impulse capabilities of the PC-2 EVO+ surpass even the values of clean power line without any devices connected to it. 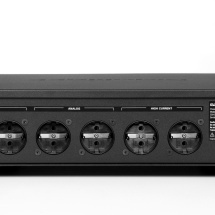 Output power sockets in a different standard. The PC-2 EVO+ is equipped with the G-040 Schuko power sockets used in most European countries. To protect your children, those sockets can be equipped with automatic anti-surge protection (improved protection conform with VDE 0620). Also available are versions with sockets in other standards like: NEMA 5-20R, used in North America and some Asian countries, or AS/NZS 3112 used in Australia. 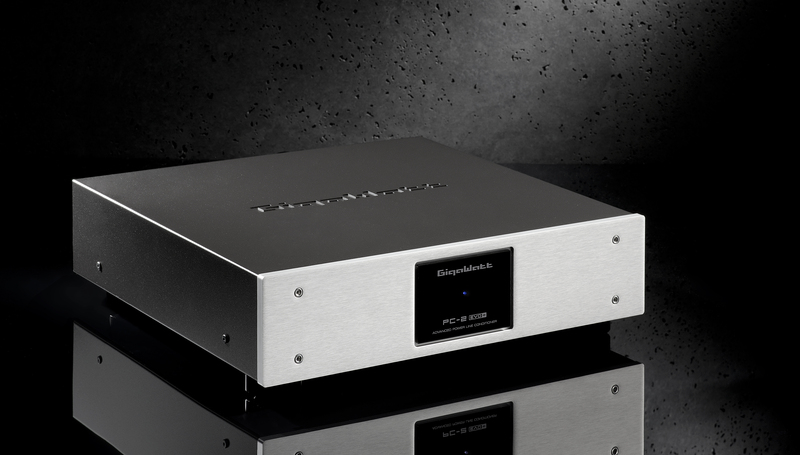 “Sound cleanliness of the stereo system powered by PC-2 EVO + is amazing, it seems that we have improved the sound of each component of this two channel installation. Good because it is Polish? In case of Gigawatt this saying is more than true. In the PC-2 EVO model, instead of a separating transformer a multi-stage filter system was applied. This means, that we have kind of three high quality power strips enclosed within once chassis. Separate passive filters isolate from interference generated by the devices themselves, and in addition the conditioner protects them from surprises coming down the power line. But who cares? Probably nobody, but I would really recommend to remember parts of the description. When you hear, what is the influence on sound caused by the PC-2 EVO with the LC-2 MkII cable, you will need to justify the spending. The difference is comparable to changing standard loudspeaker cables to Nordost tapes. The Gigawatt introduces a new dose of energy into the music. It improves dynamics, clarity, stereophony and bass control. And if somebody who does not feel those descriptions should ask you, you can just say, that it protects that, what is best. “The power conditioning devices from Gigawatt had always for me one main characteristic: fantastic craftsmanship. I did not know how they worked in my system, because for some reason I had not have the opportunity to try them out, but the external design and quality – a pure revelation. Power Conditioner & Power Cable. GigaWatt PC-2 EVO & Gigawatt LS-1. Congratulations!!! Wojciech Pacuła – Editor-in-chief.